Donald Trump spoke in Lowell on Jan. 4. Moderate Massachusetts Republicans had a good year in 2014, electing their first governor in eight years and restoring a measure of self-confidence to the establishment figures who have long run the party’s affairs. But this year, the state’s Republican establishment sees Donald Trump barreling toward a strong showing in next Tuesday’s presidential primary, and few think there is much they can do about it. No major GOP figure in Massachusetts is backing Trump. The party’s leaders have largely splintered among several non-Trump presidential candidates, presenting no united front against the outspoken New York businessman. “It’s a year unlike any year I’ve ever seen before,” said Peter Torkildsen, a former congressman and state party chairman. Bill Gillmeister, a state committee member from Brookfield, said the populist appeal of Trump caught the party’s bold-faced names unaware, particularly the popularity of his hard-line stance on immigration and appeal to national pride. This year’s primary is Tuesday, in which 12 states will vote. Massachusetts historically has not played a prominent role in GOP nominating contests. Nor does the state’s moderate Republican brand jibe particularly well with primary-season politics, which often are far right or far left to play to the parties’ activist bases. Thus far, the state’s top Republicans have not fared well with the horses they have picked. On Wednesday, former governor Mitt Romney, who has largely stayed above the fray, injected himself into the race by raising questions about Trump’s taxes. But so far Romney, the party’s 2012 presidential nominee, has not endorsed an alternative. 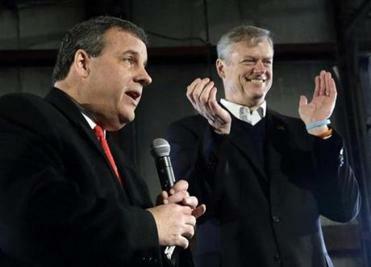 Governor Charlie Baker, right, appeared with Chris Christie in Bedford, N.H., Feb. 6. Governor Charlie Baker, after more than two years of trying to keep the race at arm’s length, and Lieutenant Governor Karyn Polito endorsed Governor Chris Christie of New Jersey days before Christie crashed in the New Hampshire primary and dropped his bid. Former governor William F. Weld, a Baker mentor, backed former Florida governor Jeb Bush until Bush quit the race after finishing a distant fourth in South Carolina on Saturday. On Monday, Weld jumped to Governor John Kasich of Ohio. Former acting governor Jane Swift, who campaigned for Bush in Iowa and New Hampshire, said Tuesday she was “leaning more toward Rubio,” but also admired Kasich. Kasich has found traction among GOP officeholders, including Senate minority leader Bruce E. Tarr, a Gloucester Republican, and about a half-dozen other GOP lawmakers. “I think the real contest now is to see who will emerge with the lion’s share of those non-Trump votes,” Tarr said of the state primary. Regardless of Tuesday’s outcome, said Tarr, the clear excitement that Trump has generated should prod the state GOP to reach out to his supporters. “One of the big challenges for the party apparatus and the party leadership here is to identify who the Trump voters are and how to incorporate them more into the activities,” he said. As it has in other states, Trump’s momentum here has survived his previous support for issues that were anathema to conservatives — abortion rights and gay marriage, for instance — and have doomed past Republican candidates on the presidential stage. 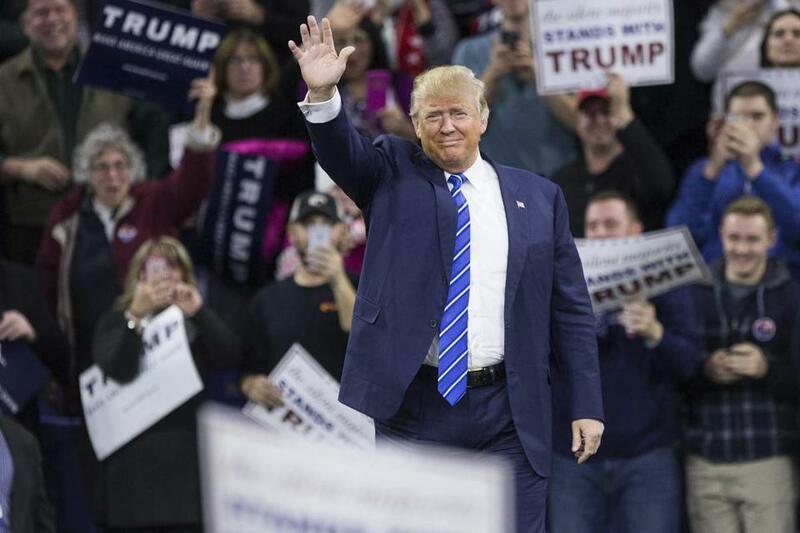 Trump has held four major campaign events in Massachusetts. In November, he drew a crowd of 10,000 enthusiastic supporters to a rally in Worcester. Last month, amid sub-freezing temperatures, a similar crowd gathered in Lowell for a raucous Trump speech. The rise of Trump, said Swift, presents “a real dilemma” for Republicans who for decades have chosen standard-bearers palatable to moderates and business-oriented voters. Mirroring national trends, elected Republicans here have mostly shied from Trump. On Tuesday, state Representative Geoff Diehl, a Whitman Republican, said he was signing on with Trump’s campaign as its state cochairman, becoming the first state lawmaker to declare formal support publicly. But Diehl is hardly considered part of the Republican establishment. Former senator Scott Brown, whose stunning 2010 victory over then-attorney general Martha Coakley likely ranks as the high point of the conservative movement here over the last several decades, has also backed Trump. A Trump campaign official said Brown would visit Trump’s campaign office in Littleton Wednesday night. But the former senator has since decamped for New Hampshire, where he ran unsuccessfully last year for the Senate. Until Tuesday, when Representative Chris Collins of New York declared his support, Trump had not picked up a single congressional endorsement. While Trump stands to benefit from a state law that permits unenrolled voters, who make up the majority of the electorate here, to vote in either primary, his heavy backing among conservatives further fractures fault lines within the state Republican Party. On the same ballot that Republicans will use to choose a nominee on Tuesday will be a slate of state committee candidates supported by Baker, as he works to tighten his grip on the party apparatus. That effort has angered some conservatives, throwing into even sharper relief the party’s divisions. Increasingly, former Republican officeholders and political professionals sound fatalistic about Trump’s prospects — to win not just Massachusetts but nationally as well. If he takes the party’s nomination, it would present some Republicans with another, larger decision: whether to support him in November. “I don’t know if I’m more afraid that he can win or that he can’t,” said Swift.